petición: Join us to protect the Great Barrier Reef and get your stickers! Join us to protect the Great Barrier Reef and get your stickers! Right now, Adani is itching to dig one of the biggest coal mines in the world in Queensland's Galilee Basin. If it goes ahead, burning coal from the megamine would generate billions of tonnes of pollution, fuel global warming and irreversibly damage our Great Barrier Reef. The reef is one of the most incredible places on Earth, home to fish, corals, turtles, whales, dolphins, sharks and rays. But it's in grave danger. If we lost the Great Barrier Reef it would be a national tragedy. And we won't stand for it. This is one of the biggest campaigns in Australian Conservation Foundation's history. We've stopped the $1 billion handout to Adani. We've stopped more than 25 big banks. Now it's time to break bipartisan support for Adani's climate-wrecking coal mine. Millions of people right across Australia have stepped up to stop Adani's dangerous mine. Now, you can join us. 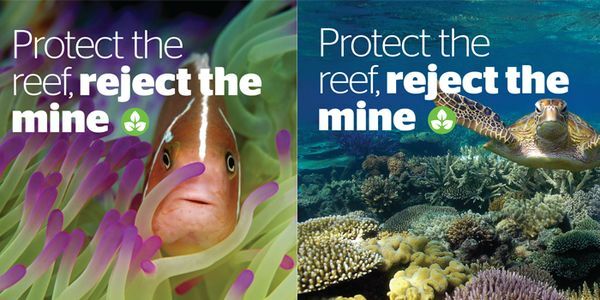 Add your name to join the fight to protect our reef and climate and we'll send you a set of campaign stickers free! Sign up today to hear more from Australian Conservation Foundation (ACF) and we'll send you free stickers to show your support for protecting Australia's reefs, rivers, forests and wildlife.